I was part of Interactive/Virtual devices team at VMware and it was a great learning experience. 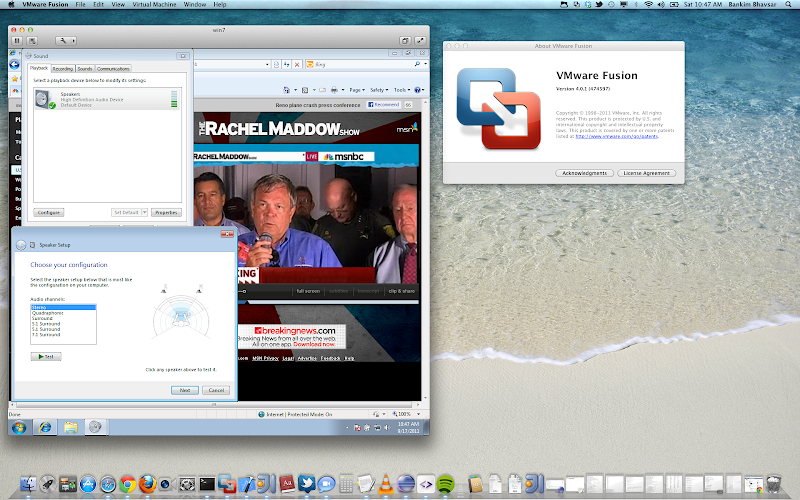 In addition to Windows Vista and above guests, virtual HD Audio device should work out-of-box for Mac OS Lion 10.7 guests on Fusion 4.0 and hence Fusion users will be able to get sound from their Mac OS guests. Linux guests (3.0+) are supported as well. Patch submitted to Linux kernel that enabled support for Linux guests with VMware HD Audio device. Virtual HD Audio supports upto 7.1 surround sound, 192kHz sampling frequency, 32-bit samples. We've had trouble getting good sound quality with surround sound on Linux hosts with VMware Workstation 8 with default settings. If you want good quality surround sound support on Linux hosts with Workstation then I'd recommend using channel-mapped device string as follows: (We couldn't implement this programmatically because of stability issues with alsa-lib that enumerates devices on Linux). 1) Suspend/Power off the VM. sound.autodetect = "FALSE" should be edited too. Similarly if you face quality issues with regular stereo sound on Linux host with Workstation 8.0 then you can try the above mentioned suggestion with device string starting with "front". Can you email me .vmx and vmware.log file of the VM? I can only provide limited help since I no longer work at VMware. @Julio: Can you email me .vmx file of the VM and vmware.log to bankim.bhavsar@gmail.com?